This quilt was hand pieced by my brother Jim who was born with one hand. 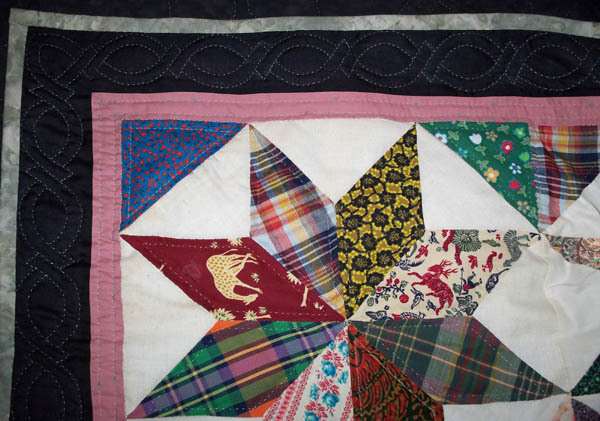 To piece this quilt, he used his left arm and knee (much like I would use my left hand) while he stitched with his right. Jim started this quilt MANY years ago. One afternoon as we were visiting, we got on the conversation of quilts and I remembered this partially completed top. When I asked him about it, he searched in his closet and pulled out the top and enough finished blocks to make a full plus size quilt. Since the top had been abandoned for over 20 years, I offered to finish the quilt. He gave me the top and blocks. I added the blocks to the quilt, then hand stitched borders from my own stash, purchased mottled black wide backing fabric, Hobbs Poly Down batting and ecru Gütermann and YLI threads. It’s quilted within the printed fabric, 1/4″ from the seams with a Celtic-style border and hand stitched mottled gray binding. Because life kept getting in the way, this quilt took over 2 years to complete. When I presented the finished quilt to Jim, he LOVED it and petted it and tried it on his bed. He then folded it up and presented it to me. It’s a much loved treasure. Absolutely beautiful…where might I find the pattern? Jim altered the pattern by changing the corner squares into 1/2 square triangles. This gives the pattern a nice sub-design and more movement. Your quilt is just beautiful and what a touching story to go with it. They are both so inspirational. Thanks for sharing. May your seams be straight and filled with love. Thanks Lauren. I was floored when he gave it to me so I offered him visiting rights. When he visits, he always uses it. WOW This quilt would be outstanding if only because Jim did this with just one hand but the detail shows the great care and precision that went into the the piecing. I am extremely impressed as I am sure more experienced quilters also are. Thanks Belle. I remember Jim taking extra care while piecing the stars to make certain the center points all came together precisely. He added extra stitches to keep them tight. He did a nice job and his stitches are small so the quilt should last for generations. My son is already looking forward to inheriting it. I love this quilt and I love the story that went with it. My grandmother, my mom’s mom, when she was a little girl her brother chopped off most of her hand with an axe on purpose!!!! She was an expert seamstress and could make everything without a pattern using on the one hand she had. I was never blessed to get to know her but I was inspired by her to be a quilter! It is so amazing what people can do once they set their mind to it. Blessings to your brother and to you for doing this for him. Thanks Ronda. Jim was always treated like the other kids and was expected to do all the things kids do. He has nearly no limitations. Awesome -Awesome Love the scrappy look & to think it was done by hand ! Gorgeous quilt! You are so lucky to have a brother who shares your love of quilting. I just love how he gave you the quilt too. Hello Shirlsu, I have been a sewer for 40 or so years. 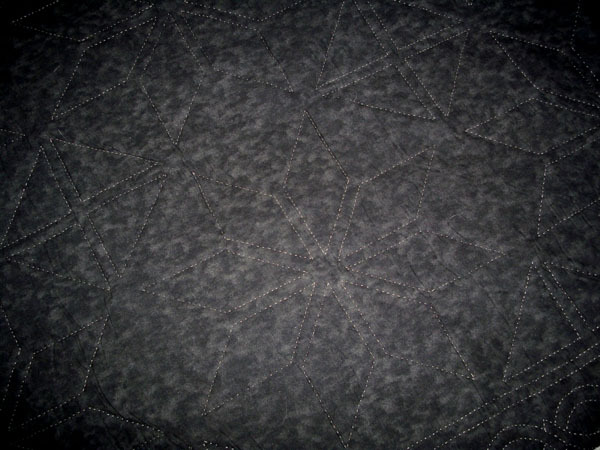 I couple of years ago I decided to learn how to Quilting. You brother is a very clever man & generous. My curiosity is piqued. Ronda why did your grandmothers’ brother chop her hand off? Curiosity will kill this cat one day. This is work of love to treasure forever. I totally agree, Lena. I often look at it in total awe. What an awesome story. Some of us have hard things to deal with and some deal with those things with grace and style. Hat’s off to your brother, Jim. I congratulate him on the work he did. It looks amazing. I know I could not have done better. Thanks Jennifer. I’ll be sure to forward your thoughts to him. What a beautiful achievement! The placement of color, and design is outstanding! This quilt should be cherished forever! Thanks Melanie. It will be loved forever! I love the quilt LeMoyne Star. I am not a big quilter now but have made several baby quilts. Thanks Thelma. I bet those baby quilts are wonderful treasures. Hope you continuing stitching. 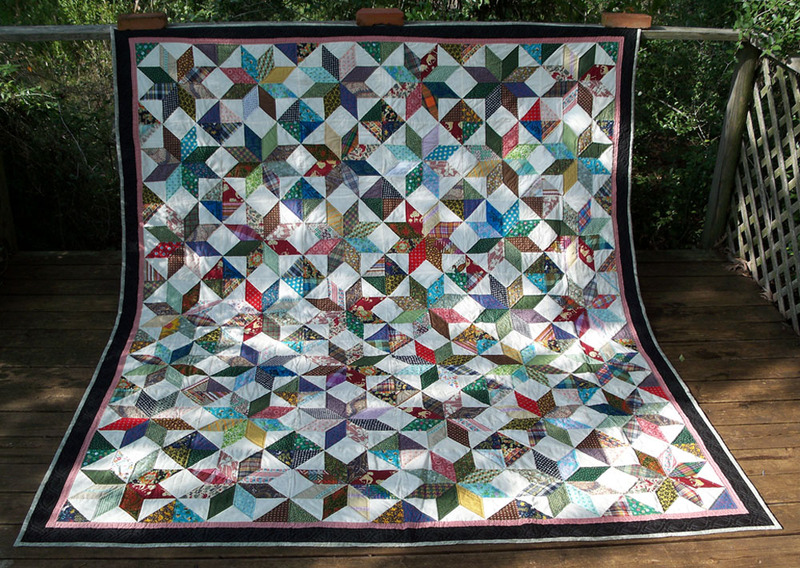 I’m a lover of all things batik and the quilt you’ve designed is gorgeous! So glad you’ve found inspiration in Jim’s quilt. I will pass your message on to him. Happy Valentine’s Day!